how incredible is this? cinnamon basil. pretty sure my mouth hit the floor and i grabbed the plant straight from Ginny's hands when she mentioned cinnamon basil. this was a first for me. how is it i have never heard of this amazing variety of basil? 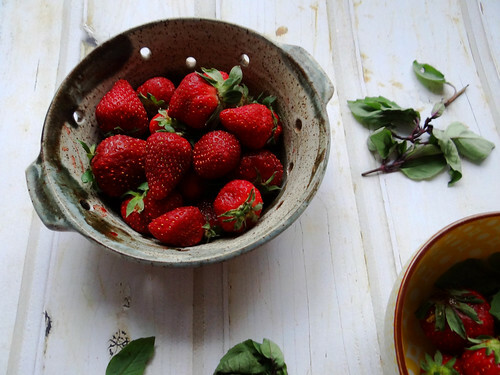 armed with another pint of native strawberries i knew exactly what i wanted to make with my new found basil. 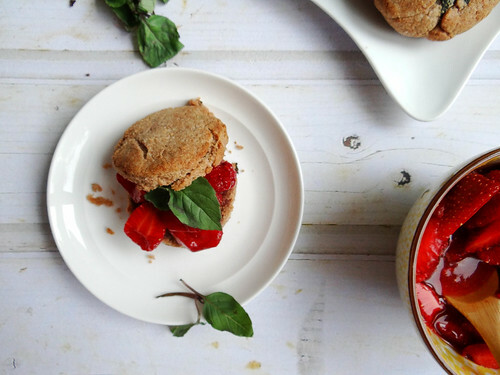 strawberry shortcake with cinnamon basil biscuits. it was total love at first bite. 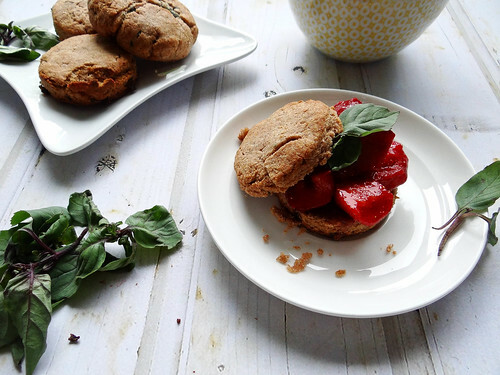 agave sweetened spelt biscuits with cinnamon basil was the perfect fit. the biscuits are baked - my intent was to bake these on the grille, however when a cold front moved in last week i decided the oven would be best. native strawberries are hulled and quartered. then sprinkled with a healthy dose of a stevia sugar blend. this is new to me - i came across a domino stevia sugar blend on sale and decided to give it a try - it was pretty good. this is only based on the above recipe, i am curious to see how it does in baked goods. once assembled the flavors play along with each other amazingly well. better than I had hoped for. after each bite by taste buds would do a little happy dance. 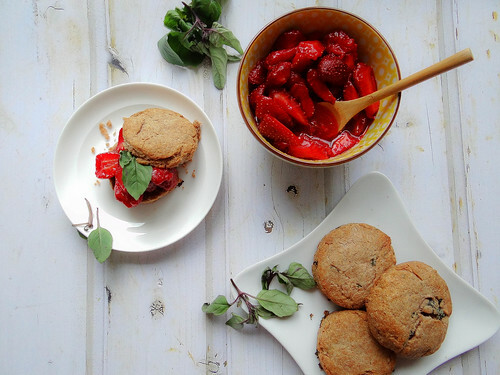 a perfect dessert to end a day of berry picking or a weekend BBQ.the biscuits & strawberries can be made up to 2 days in advance. 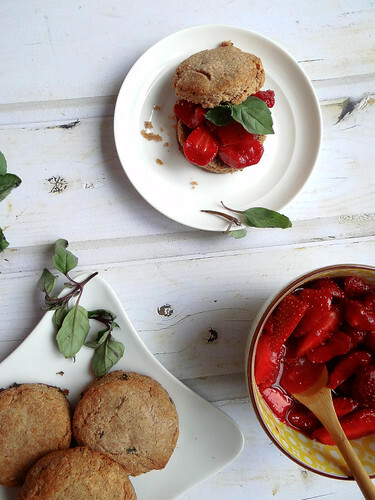 i strongly recommend serving each shortcake with a little scoop of your favorite vegan ice cream or a healthy scoop of coconut whipped creme - or mimi creme! 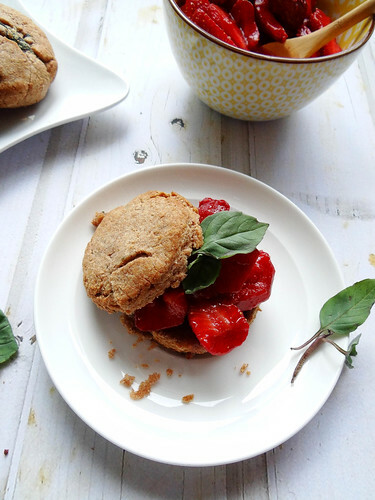 this little extra brings together all the flavors in the shortcake. 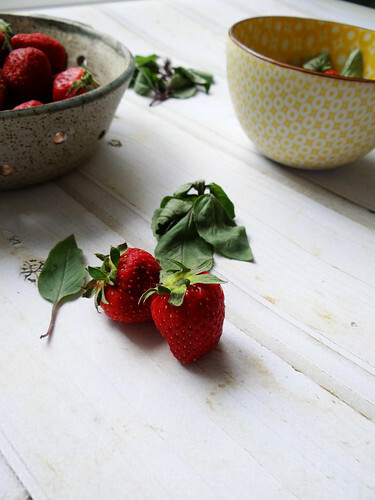 so take sometime this weekend, grab a pint of berries from your farmer or farmers market and carve out a little time this weekend to make this super awesome dessert.having trouble finding cinnamon basil? simple omit, you will still have yourself a wonderful treat. stir in agave & milk until dough comes together - turn out onto a lightly floured surface. gently knead remaining flour into dough. pat dough into a 1/2" thick square/round, using a biscuit cutter - cut 2 biscuits from dough, reshape dough and cut 1 additional biscuit. form remaining dough into the last biscuit. 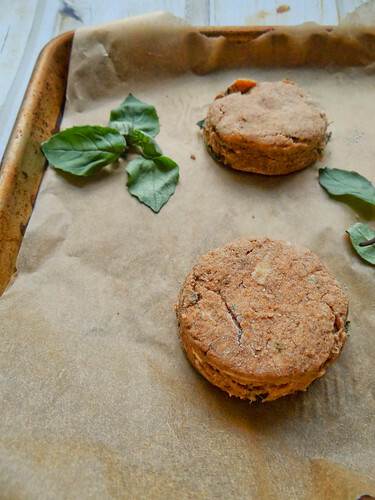 transfer biscuits to a parchment lined baking sheet and bake for 20 minutes. remove from oven and allow to cool on a wire baking rack. biscuits can be made up to 2 days in advance. 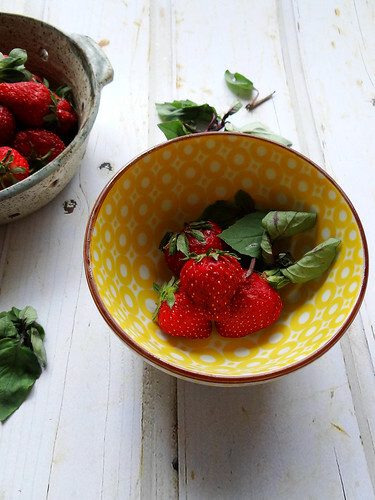 prepare the strawberries by rinsing, hulling and quartering the berries. 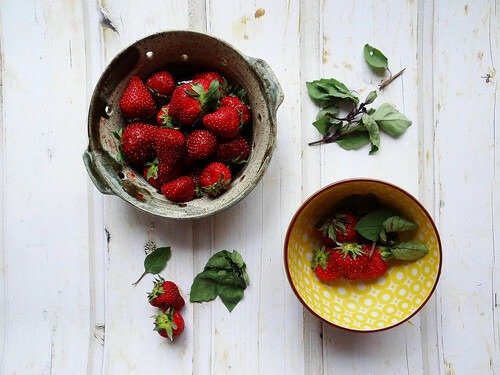 place strawberries in a medium bowl and toss with sugar - allow to sit for at least 1 our to give the berries a chance to release their natural juices. Oh yum! 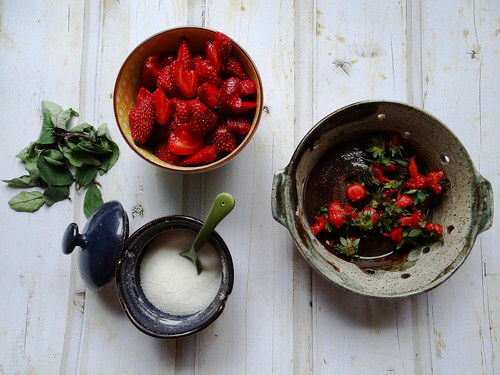 I love basil and strawberry together. Or basil and beach! or basil and lemon. 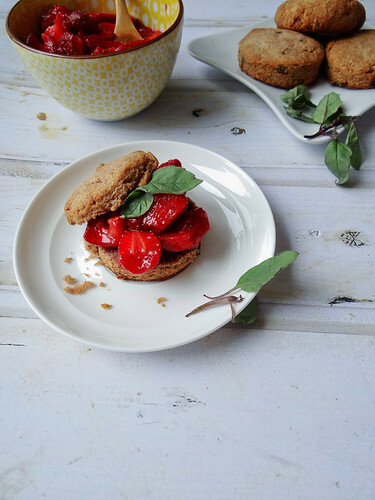 Basil is just great to slip into sweet things. Haha basil and beach thats a new one!....pretty sure it was supose to be peach :) right? I LOVE Basil, I started some gourmet basil from seed for the garden and one of them is lemon basil - so amazing! This looks so delicious! I need to hunt down some cinnamon basil now - it sounds incredible. Cinnamon Basil is super amazing - I can't get enough of it and I can't believe I am only finding about it now! oh yum!! what an interesting combination! they look so delicious adn fabulous! thanks for sharing your beautiful recipes! This was such a fun recipe to make, photograph & devour! How cute! Looks like a perfect summer treat. Totally a perfect summer time treat! LOL those would be pretty different pancakes for sure :) ...hmmm cinnamon strawberry pancakes do sound pretty good though! 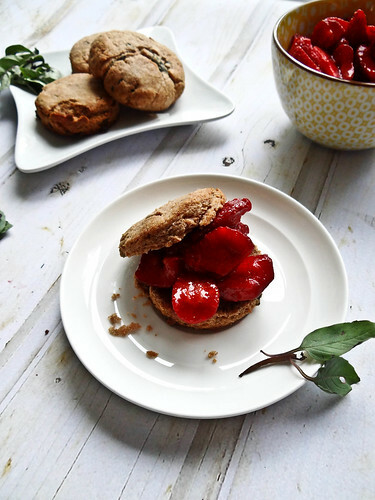 I'm so excited that you made your own version of strawberry shortcake - that has to be one of my all-time favourite desserts! I've tried a vegan version from a cafe once, but usually we just have make the traditional non-vegan kind. 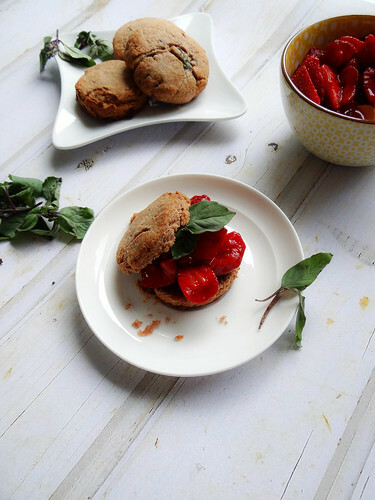 It's fun to change it up once in a while though with new flavours, like cinnamon basil! Also, I've tried the domino blend packets for my coffee, but I find they don't provide enough sweetness compared to other brands of stevia. 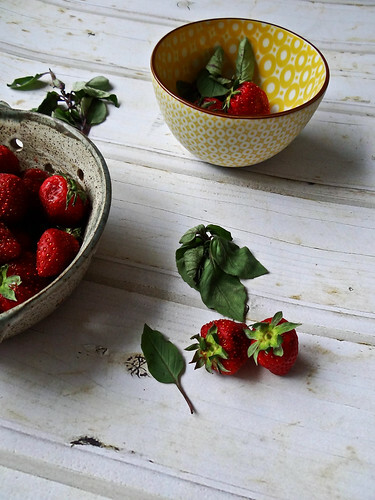 I love any type of in season summer fruit dessert - they are so versatile! 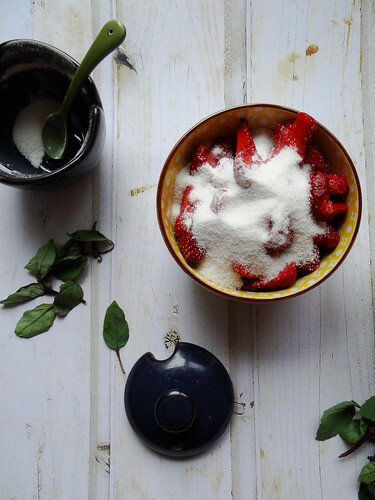 What kind of stevia do you use/reccomend- I am looking to experiment with a few non processed sweeteners, i would love to hear what works for you! Hmm, I tend to try different brands depending on what's on sale! I liked NuNaturals NuStevia packets - I like my coffee sweet and I found one packet of their brand was the right amount of sweetness for me. Now I'm using Truvia in my coffee and I like it too - its a better balance between the sweeter NuNaturals and the less sweet Dominos blend. I also have the chocolate and vanilla flavored liquid NuNaturals droppers which I like to use sometimes in my tea/chai and other recipes! Awesome thanks for the info - I am going to gove those a try, i have seen both those brands before! LOL maybe someday :) Thanks! these are lovely, lady! i have never heard of cinnamon basil but now i am DYING to try some! basil is already my favorite herb, so this is just going to make my heart singggg! I can NEVER get enough of basil during the summer straight from the Garden! 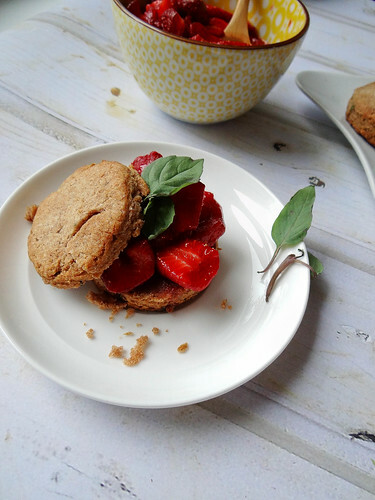 I had never used basil in a sweet dessert, but the cinnamon basil totally was calling out to be made into little strawberry shortcakes! i havent tried cinnamon basil. sounds like a fantastic flavor combinations. 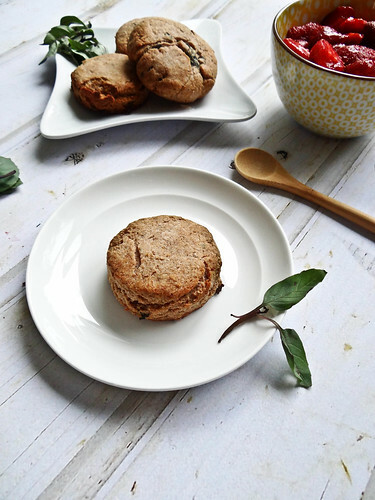 those spelt biscuits look so crumbly and the rustic bowl is so pretty! 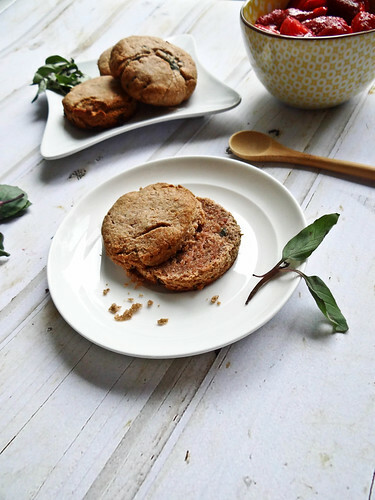 I LOVE spelt flour - these biscuits turned out even better than I had hoped for! Cinnamon basil!? Holy crap!!!! Where can I find some!? Last year I grew some pineapple sage and pineapple thyme. Soooo yummy :) The smell was amazing. Love strawberry shortcake! I'm excited to try the spelt biscuits. I'm trying to eat more spelt and less wheat as of late due to tummy aches. Gorgeous photos! :) You always take such pretty pictures! No way, Pineapple Sage and Thyme - Okay I am totally in heaven know and going to get my google on to find some seeds - those sound incredible! And I can only same the same and more about YOUR photos -they are always so inspiring! Oh my the cinnamon....the extra cinnamon with cinnamon basil was increcible! These look and sound so yummy! Can't wait to try them. Only problem is where to find cinnamon basil? Can I cheat and use basil from the garden with a dash or two of cinnamon? You could definitely use regular Basil and it already calls for cinnamon so you should be golden! Thanks Cathleen! They were so easy to make and super yummy too! You totally should have - next time make sure you come home with some, I can only imagine how you would use it - I am sure in some incredible way! 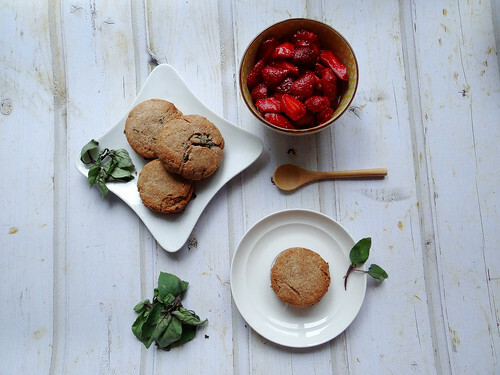 Your photos are gorgeous, and this looks so wonderfully delicious! I can't wait to try it - as soon as I get my hands on some cinnamon basil! Thank you so much Rachel - if you can't find cinnamon basil feel free to sub in lemon basil or standard basil too! 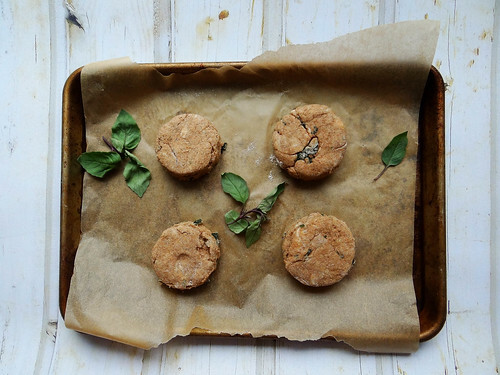 Great Idea for using our basil! Thank you-sure to love it!